For a long time, European banks were in the habit of financing public deficits, mainly of their own countries, by buying government bonds. This was a practical alliance between governments, who needed financing for their profligate spending, and lenders, who received AAA-rated bonds that by law were regarded as safe and therefore did not have to be backed by additional bank equity. On the surface, this appeared to be a perfect perpetuum mobile, a win-win for both sides. The global financial crisis of 2007-2008 started with the subprime mortgage market in the United States. The essence of the subprime crisis was that government programs to encourage mortgage lending allowed excessive, uncovered debt to accumulate. To refinance this debt, which was considered safe, the subprime mortgages were bundled into so-called “asset-backed securities.” These mortgage-backed securities were declared as high investment grade and placed with investors and banks worldwide. With the outbreak of the crisis, it turned out that bad mortgages do not become safe investments when they are bundled together. The whole banking system was in danger of collapse, and many lenders had to be bailed out by the government. Two years later, the government debt crisis started when Greece, whose sovereign rating was AAA, became insolvent. Since many other European countries had excessive debt, the danger of contagion was large. As bond prices plummeted, the authorities had to admit that the value of public debt was not secure, which meant that major European banks – many of which held huge government bond portfolios – were in trouble. As a remedy, the European Central Bank cut interest rates to zero and then below. But negative rateshad the effect of destroying private savings, and could not be maintained forever in any case. The ECB also began a program to pump liquidity into the financial system by buying 80 billion euros of bonds each month from the commercial banks. This so-called quantitative easing could also not be continued indefinitely without destroying the currency. The ECB has indicated it will begin to cut back its bond purchases in the second half of 2018. The need to withdraw from lax monetary policies has revived in European institutions a legitimate concern – probably 15 years too late – about the “doom loop” linking governments and banks, both held hostage by excessive debt. Over the past decade, few European governments have cut their debt burden, and with the ECB now tapering off its bond-buying program, commercial banks will now have to write down some of the government bonds held on their books. 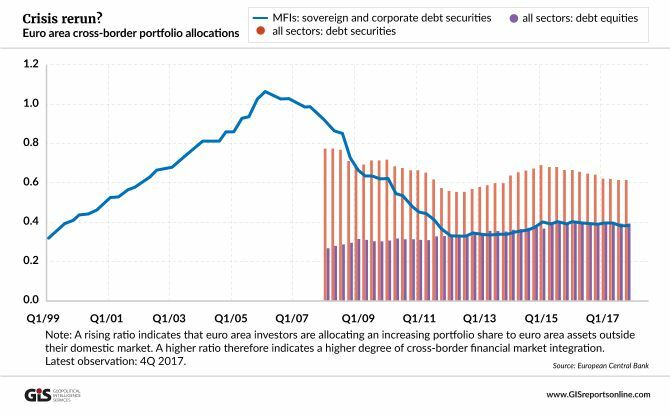 Just like the mortgage banks before the financial crisis, the European Commission is proposing to paper over this bad debt with asset-backed securities. What it plans to offer to the financial sector and investors are called “sovereign bond-backed securities,” or SBBS. Banks would repackage the sovereign debt they hold into this new product, pretending that diversification will make the debt more secure. SBBS would come in two varieties – one with relatively safer bonds paying lower interest, and another grouping debt of lower-rated countries and offering a higher risk premium. The idea is to reduce risk exposure for banks and governments while advancing the completion of the Banking Union and Capital Markets Union. There doesn’t seem to be much difference between the asset-backed securities responsible for the 2007-2008 financial crisis and the European Commission’s proposals. In the former case, banks wanted to get subprime mortgage securities off their books because they were not secure; SBBS simply apply the same logic to government bonds that have lost their quality. What could go wrong? If something happens, governments will blame market failure, even though the meltdown’s causes will be plain enough. The culprits are the same as a decade ago: excessive public spending, wrong incentives and misguided political interventions.